One of the most frustrating experiences when eating out is being held for check ransom. We’ve all been there. We’re done eating and want to pay the check, but……there is no one around to give you the check. OR, once you hand over your credit card or cash……no one returns with the card or the change, for a long time. It’s like being held ransom. All you want to do is pay for your food, drink, and service and leave. Instead you’re stuck waiting. Thankfully it doesn’t happen often. 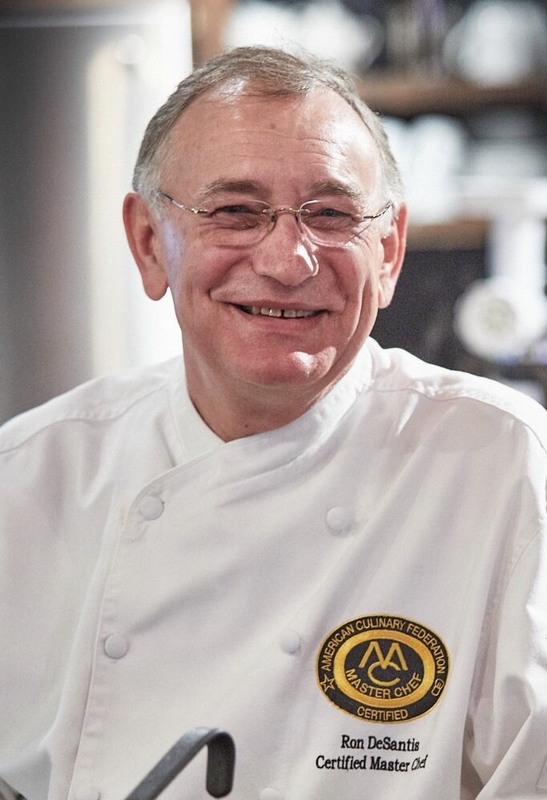 Concept Development is a critical task for managers and executive chefs. This part of foodservice operations is the foundation for recipe development, equipment needs, service needs, and the operation’s labor model. To begin concept development, the operation’s team must develop a concept statement. The concept statement guides the planning and keeps the development team on course. Without a concept statement it’s easy to get sidetracked and end up with a menu that is a combination of “stuff” instead of a menu that has complimentary foods. Concept Development has 3 Stages: Conceptualization/ Crystallization/ Realization. The conceptualization stage is generally the most demanding. This is where the team develops the concept statement, and it is where the passions fly. This is critical to the process so that everyone is heard, and the outcome is embraced by the entire team. During crystallization the team determines the concept value and how to market the concept. The final stage of realization is where the team is ready to launch. Operators that engage a structured development process end up with an interesting, exciting, and viable concept. Give me a call for detailed information. Working with a great group of chefs is always fun and rewarding. The results are great food, lots of laughs, happy guests, and strong friendships. This group of chefs – Dan Flynn, Cyon Jones, Dave Kuzma, and Chase Sobelman– worked with me on a project that produced the following delicious dishes. 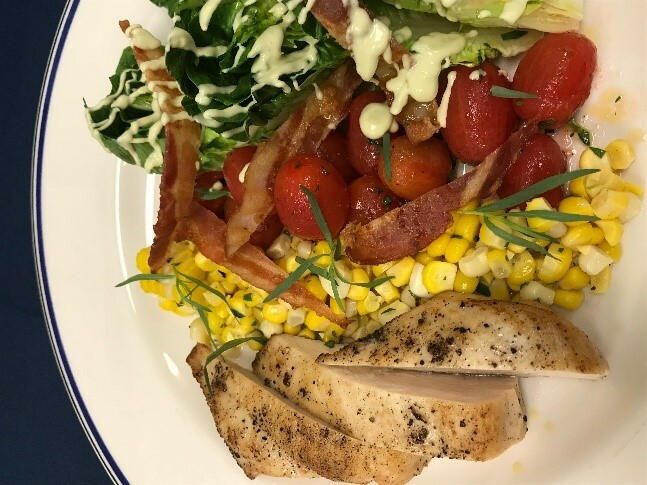 Green Goddess and Grilled Chicken Salad – little gem romaine with late season corn, grilled chicken breast with smoked salt, and Black Label Bacon. 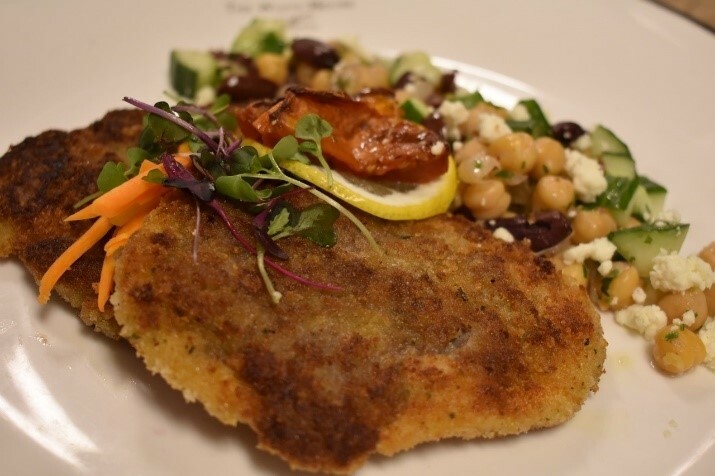 Crispy Sicilian Stuffed Turkey Paillard with Mediterranean Salad – Sicilian sausage on a turkey scaloppini, breaded and pan-fried with a Mediterranean-style chickpea, cucumber salad. 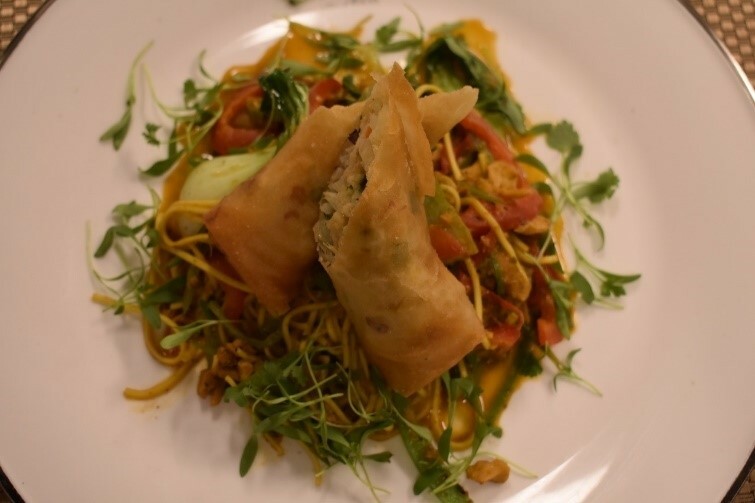 Vegan Crab & Noodle Kung Pao – Hungry Planet vegan crab, lo mein noodles and kung pao sauce with a vegan crab spring roll. 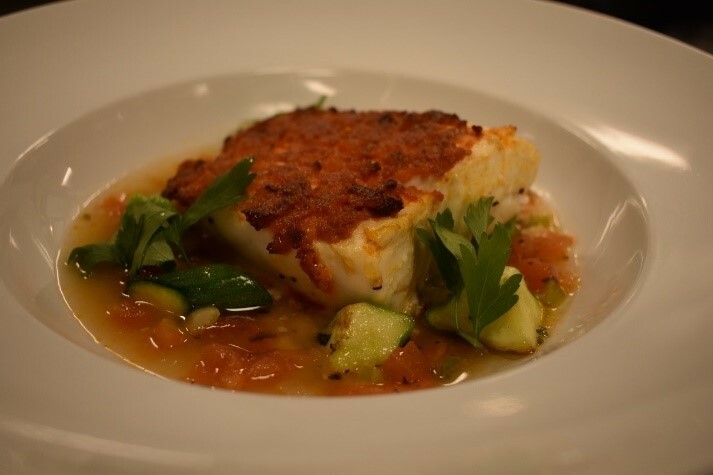 ‘nduja Seared Halibut in Summer Cioppino – spicy New England Charcuterie ‘nduja seared on halibut filet in cioppino-style broth with summer squash. 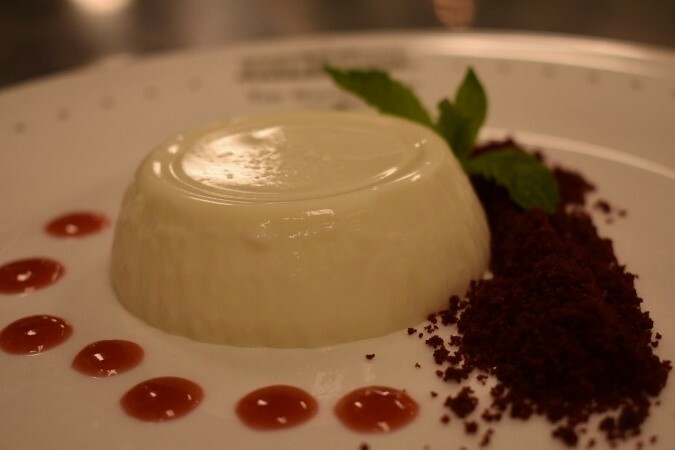 Red Velvet Panna Cotta – vanilla- buttermilk laced panna cotta with red velvet crumbles. The first impression at Noreetuh in NYC is hospitality. Immediately. The next impression is an immaculately clean and organized kitchen run by Chef Chung Chow. Chef Chow’s resume includes, Bouchon Bistro in Yountville, CA, Per Se in NYC, and Lincoln Restaurant with Jonathan Beno also in NYC. 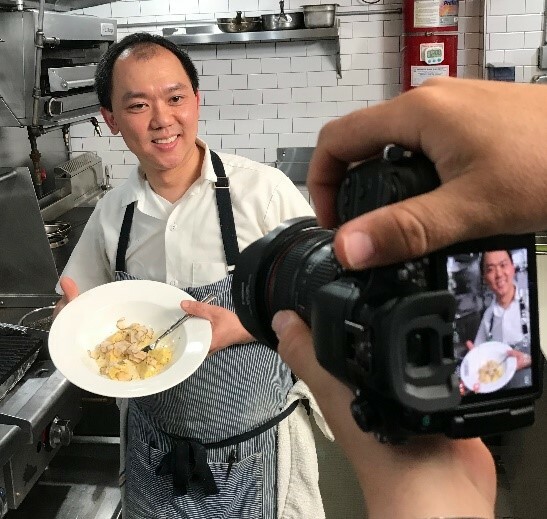 On the day of my visit, Chef Chow used his experience growing up with Hormel Foods’ Spam and created exquisite dishes complete with hand-made pasta, truffles, and musubi. It was great meeting Chung and we had time to become acquainted (a link to our podcast is below). The lunch was a great experience.